When would you like to stay at Royal Clipper Cruise - Check Availability & Room Rates!!! Royal Clipper Cruise; which was built in 1902 is considered to be the fastest and widest sailing ship in the World. 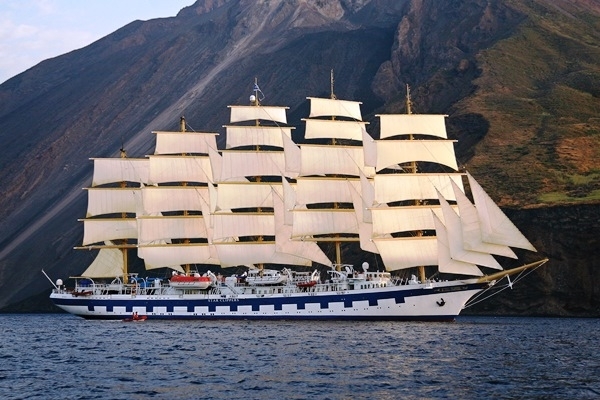 Royal Clipper combines luxury and romance with traditional lifestyle of sailing ships. Royal Clipper is famous for being the only sailing ship with 5 masts in the World. Being 134,8 meters in lenght, Royal Clipper serves 227 passengers with its 106 crew members. Ship has also 42 sails and 5 masts. Offering wide living space to its guests, Royal Clipper addresses to every tastes with its deck made of teak tree, its antiques, its furnitures made of mahogany and its gourmet dishes. Royal Clipper has 3 swimminp pools, bars and activities of water sports. There are toilets with shower, air conditioning, safe box, hair dryer and TV with DVD player in each room of Royal Clipper. Having 1760 square meters open deck and 3 swimming pools, Royal Clipper offers 24-hour room service. There are 14 deluxe suites and 98 cabins in Royal Clipper.